Mötley Crüe -- A Nikki Sixx Smashed Gibson Blackbird Bass Guitar (2005-2006). Black, mother-of-pearl 'iron cross' inlays on neck, clear plastic pickguard with blackbird cross emblem, headstock broken off but still included, no strings, serial number "01091373," signed in silver paint pen on the back "Nikki Sixx;" used extensively by Sixx on the 2005 side band 'Brides of Destruction' tour; Sixx only broke four of these Blackbirds in his career, this one being one of his regular basses that he played for months (or even years) and then decided to smash onstage; the current owner purchased this in the 2006 online auction conduced on Sixx's website where all proceeds went to 'Running Wild in the Night' which is a division of Covenant House; included with a COA signed by Sixx and some other related paperwork. 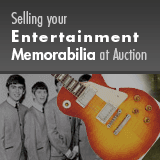 Only 31 days left to consign to the 2019 July 20 Entertainment - Dallas! The movie quite literally changed my life. I have included a pic of me in Sly's Rocky 3 Cashmere overcoat, would much appreciate if it is possible for you to forward this email to Sly to let him know the overcoat is in good hands, and will be well taken care of, (as will be the Rambo knife forging tools, the other lot I won!) Wish you very happy holidays and a great 2016!